North Dakota U.S. 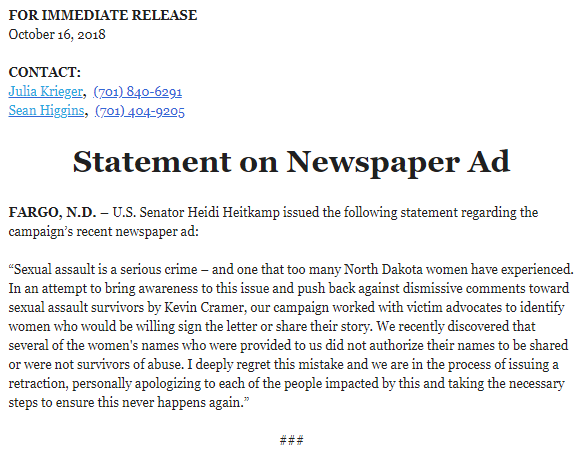 Senator Heidi Heitkamp, running for re-election, ran an advertisement listing the names of alleged sexual assault or domestic abuse survivors. Several of those named never gave permission for their names to be “outed”, and some say they were never a victim of sexual assault or domestic abuse. At least one of those named said the Heitkamp campaign sourced their use of the name to a Facebook post (Facebook is always a reliable source – not!). Sen. Heitkamp herself says they appear to have come from a “Facebook feed”. Heitkamp said she was investigating how her campaign obtained the names. She said they may have come from a “Facebook feed” that was forwarded to the campaign. Those named are fearful the allegations may lead to targeting the women named and current or former family members. They also say they have been publicly humiliated. Lesson: Never use Facebook posts as a source of critical information without subsequent verification and corroboration. CNN also covers this mess.